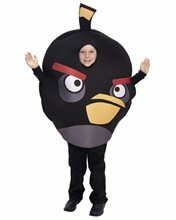 Pac Man "Blinky" Deluxe Child Costume.Includes: Costume and Gloves.Available Size: Standard - One Size Fits Most Children. *Shirt, Pants and Shoes Not Included.Features: Red Blinky pullover to wear on your shoulders or over your head.A-maze-ing! 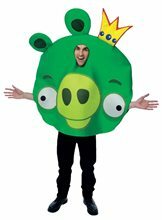 Add a nostalgic touch to your next costume bash in this Blinky costume! Perfect for Halloween or any 80's flashback party. Includes a red ghost bodysuit that can be worn on your shoulders or over your head for maximum impact. Also includes coordinating gloves. 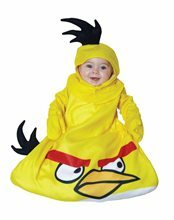 Pac Man "Clyde" Deluxe Child Costume.Includes: Costume and Gloves.Available Size: Standard - One Size Fits Most Children. *Shoes, Shirt and Pants Not Included.Features: Orange "Clyde" pullover to wear on your shoulders or over your head.That tortoise may have been onto something. It's slow and steady that wins the race when you're this pokey ghost of arcades past! 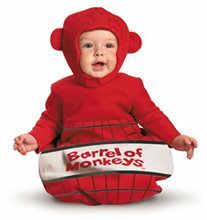 Get a kick out of this nostalgic Clyde costume! Perfect for Halloween or 80's flashback parties! Includes one orange ghost bodysuit that can be worn on your shoulders or over your head for maximum old school impact. Also includes coordinating gloves. 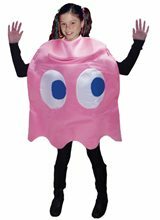 Pac Man "Pinky" Deluxe Child Costume.Includes: Costume and Gloves.Available Size: Standard - One Size Fits Most Children. *Shirt, Pants and Shoes Not Included.Features: Pink "Pinky" pullover to wear on shoulders or over your head.Think pink. The speediest and most cunning ghost in the fleet, you're sure to catch that Pac Man eventually! Take a trip down memory lane in this nostalgic Pinky costume. Includes a pink ghost bodysuit that can be worn on your shoulders or over your head for maximum impact. Also includes coordinating gloves. Street Fighter Ken Adult Costume.Includes: Polyester red wrap style top, red pants, black belt and gloves.Available Size: Mens - Small (34-36), Mens - Medium (38-40), Mens - Large (42-44). (See Size Chart For More Information) *Wig Not Included. Accessories Sold Separately.Bring out the Street Fighter inside with this official Adult Ken Street Fighter Costume this Halloween. Team up with Ryu and Chun Li for a terrific group costume idea. This righteous Adult Ken Street Fighter Costume is the master of all disguises and you are sure to be the world warrior in this great looking costume. Adult Ken Street Fighter Costume includes polyester red wrap style top, red pants, black belt and gloves. Wig not included. 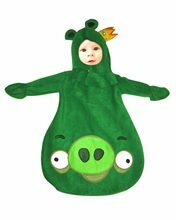 Available in adult sizes small, medium and large.